Miss Berry speaks of the wonderful time she had with Mrs. Eagan and the children and mentions a photograph of them. She explains that the Fords gave a gift of buildings at the Girl's School but not at any of the others. Miss Berry says she misses Mr. Eagan's advice at times like this because he always knew how to handle such situations. She asks Mrs. Eagan to speak with Mr. Caldwell. 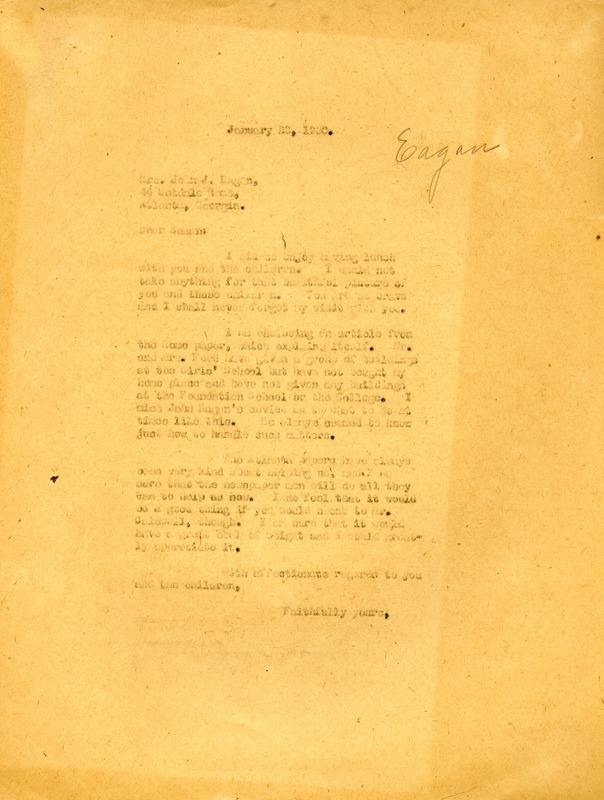 Martha Berry, “Letter to Mrs. John Eagan from Martha Berry.” Martha Berry Digital Archive. Eds. Schlitz, Stephanie A., Chelsea Risley, Rachel Renaud, et al. Mount Berry: Berry College, 2013. accessed April 20, 2019, https://mbda.berry.edu/items/show/12414.